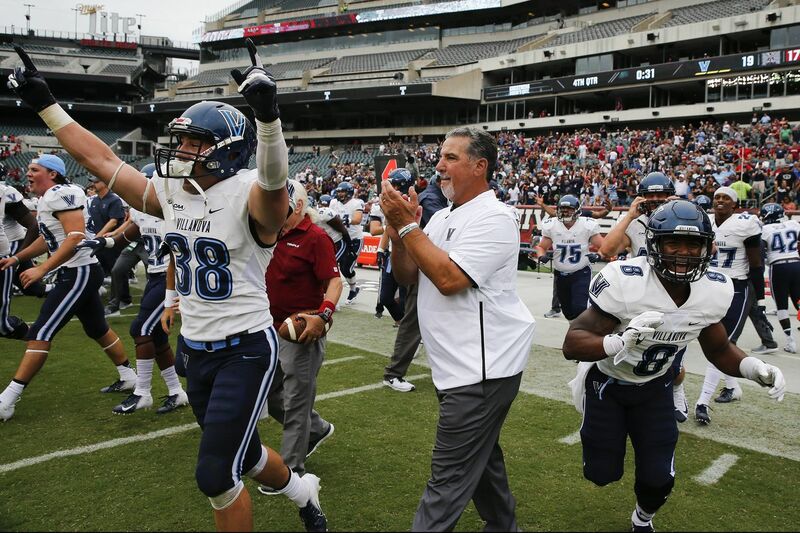 After his team upset Temple 19-17 in its season opener on Saturday, Villanova coach Mark Ferrante acknowledged that beating an FBS team was big for his program, but emphasized that the win doesn't have more overall impact on a season than beating an FCS program like the Wildcats normally face. "We always try to talk about having a nameless and faceless opponent," Ferrante said. "But it just means a little more, I guess, nationally and those type of things to play up a level come out with a victory." The national response to 'Nova's win, however, was immediate: the Wildcats moved up eight spots in the AFCA FCS Coaches poll from No. 19 to No. 11. In the STATS FCS poll, they moved up seven spots from No. 19 to No. 12. The Colonial Athletic Association has six schools in both polls. Villanova is joined by James Madison, which is ranked second in both, along with Elon (15th in both), New Hampshire (22 in AFCA, 20 in STATS), Maine (25 in AFCA, 22 in STATS) and Stony Brook (23 in AFCA, 24 in STATS).